Oil on cardboard, 40 x 30 cm. During his stay in Italy, Marstrand became deeply fascinated by the local women and their seductive beauty. He portrayed many of them in his sketches and paintings. Inspired by Goethe’s Roman Elegies, the meeting between a beautiful Italian lady and her lover became a recurring theme in his works. 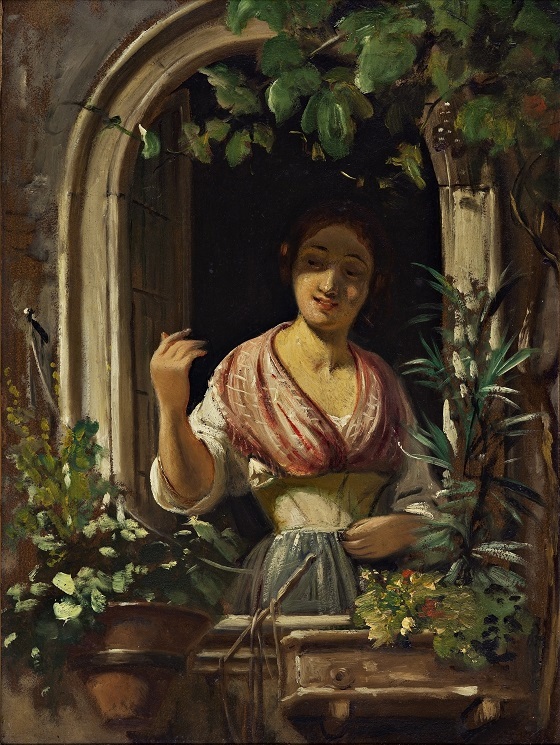 In this sketch, the lover’s presence is only suggested by the inviting wave of the young lady from her window. The intoxication of love and fertility is underscored by the grape vine winding over the woman and framing the composition. Under the vines bloom the beautiful but also poisonous oleander shrub, which in Greek mythology was associated with the tragic romance between Hero and Leander.